Overgate Hospice Choir is delighted to be joining forces for a second Spring concert with our friends from Hammonds Saltaire Band. Do join us at 7.00pm on Saturday 8th June in the magnificent surroundings of All Saints’ Church, Savile Road, Elland for what promises to be a really entertaining evening. On the last occasion our two groups came together in Spring 2017 the concert was a sell-out, with not a seat to be had, so do please get your tickets in good time. Dr Simon Lindley, Music Director of Overgate Hospice Choir for the past twenty years, will share the conducting with Morgan Griffiths and Alan Horsey is on organ and piano. Details of the full programme listing will be published shortly. Hammonds Saltaire Band has an impressive pedigree, with an unbroken sequence of 75 years under various names, and roots going back 150 years to when, in 1855, a brass band was formed as one of the amenities for the people of Saltaire. This was one of the famous ‘model villages’ built during the first half of the 19th century by wealthy industrialists and was the brainchild of Sir Titus Salt, a philanthropic mill-owner and one-time Mayor of Bradford. 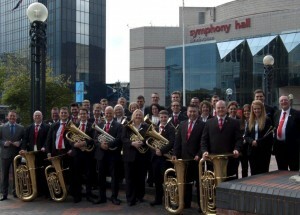 In recent years the band has contested throughout Europe, recorded numerous CDs and performed at some of the best concert venues in the world as the Yorkshire Building Society Band. Prior to that the band [as Hammonds Sauce Works] enjoyed contest and concert success under the baton of Geoffrey Whitham for nearly thirty years. 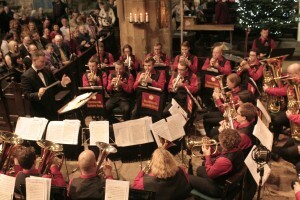 Hammonds Saltaire Band have enjoyed great success on the contest platform. As the Yorkshire Building Society band they were European Champions eight times in nine years [1996, 1997, 1999, 2000, 2001, 2002, 2003 & 2004] and have won the British Open and All England Masters on several occasions. Being a Yorkshire band they were proud to be crowned Yorkshire Champions in 1994, 1999 & 2004. In March 2011 they were delighted to yet again be crowned Champions of Yorkshire for the fourth time in their history and the first time with their current name, Hammonds Saltaire. Under the guidance of musical director Morgan Griffiths the members of the band are looking forward to a successful future which builds upon the rich heritage of their past. The current name taps into that heritage by incorporating the two names [Hammonds and Saltaire] that have had long associations with the band. Both have strong links to the band’s original home city of Bradford and show their origins within the industrial heritage of the area. Born in Batley into a strong brass banding family, Morgan was, in his formative years, taught by his father – joining his father’s band – the Yorkshire Bus Company – at just nine years of age. After a short period on cornet, he switched to euphonium, studying with legendary Black Dyke soloist Geoffrey Whitham, who was to have a major influence on Morgan’s playing style. In January 1990, after a brief spell with the Hammonds Sauce Works band, Morgan was the youngest player ever to be appointed Principal Euphonium of Black Dyke Mills Band, where he established a reputation as one of the finest euphonium players in the world. It was during this period that Morgan first came under the influence of brilliant Australian conductor, later mentor, Professor David King. Whilst at Dyke, Morgan won two European titles and was Principal Soloists on their very successful tour of Japan. In 1992, he was invited to join the newly-named Yorkshire Building Society Band, again working with David King and becoming me most successful euphonium soloist of his generation with the award in 1999 of International Euphonium Player of the Year, CD recordings and championships. 2004 saw Morgan’s return to the YBS Band where he gained a further All England Masters Championship title as well as being a featured soloist on the Band’s 2005 Kings of Brass tour of Australia. On return to the UK, Morgan turned his focus to conducting and musical direction, again under the mentorship of Dr David King. Morgan is looking forward to a long and successful relationship with this famous band. In 2007 Morgan was appointed Resident Music Director [of what was still the YBS Band] and in 2008 as Music Director of the newly named Hammonds Saltaire Band. In addition to his conductorship of tonight’s band, Morgan is Music Director of Bradford Youth Orchestra. His work in Bradford for the city’s Music and Arts Service has resulted in him forming in 2011 the Bradford Youth Brass Band, an ensemble gaining increasing recognition at national level. Morgan is married to Hannah, a fine trombone player herself, who has a PhD in Chemistry. They have two children. Alan Horsey was born in the New Forest town of Fordingbridge and received his musical training at the Royal College of Music. Following appointments at Leeds Minster [formerly Leeds Parish Church] and St James, Muswell Hill, London he served as organist at Bradford Cathedral 1986-2002 and for a long period as conductor of the Otley and Ilkley Choral Societies. 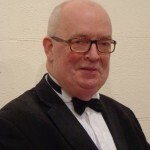 Alan is accompanist to Leeds Philharmonic Society and to Overgate Hospice Choir, working additionally with Sheffield Bach Choir and Doncaster Choral Society when possible. Such spare time as Alan now has is devoted to pipe-organ restoration, working with John R. Clough and Son Ltd. His leisure pursuits include domestic poultry and woodwork. Dr Lindley’s connection with Halifax music extends back to the time of his first recital here in the late 1960s at what was then Halifax Parish Church. 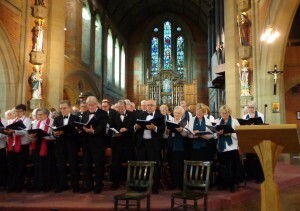 This year he celebrates twenty years’ service as Music Director of Overgate Hospice Choir. 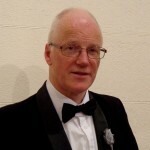 Simon is also a Trustee of the Halifax 900 Trust and assists with the music at the Minster. From 1975 to 1988, Simon held office as Chorus Master to Halifax Choral Society, working closely with Dr Donald Hunt. Dr Lindley is Organist Emeritus of Leeds Minster, where he served as Master of the Music for 41 years, Leeds City Organist and the long-serving Music Director of St Peter’s Singers. 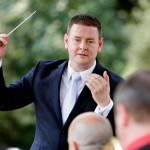 Simon is Conductor of Sheffield Bach Choir and Doncaster Choral Society. He lives at the Moravian Settlement in Fulneck at the confluence of the West Riding industrial and rural heartlands, where he gives monthly recitals in the famous 18th century church on the Snetzler/Binns instrument and presents annual choral concerts there in association with St Peter’s Singers and the National Festival Orchestra. Before moving to Yorkshire in 1975, Dr Lindley worked as Director of Music to two City of London churches and at Westminster and St Albans Cathedrals; he was also Director of Music to St Albans School. Simon, a former President of the Royal College of Organists, is a life Vice-President of the College and an elected member of its Trustee Council. He is the recipient of a number of honorary awards, most recently The Leeds Award in September 2016 and the holder of doctorates conferred upon him by Leeds Beckett University and the University of Huddersfield, the latter citing his contribution to choral music locally, nationally and internationally.